At Oslandia, we like working with Open Source tool projects and handling Open (geospatial) Data. In this article series, we will play with the OpenStreetMap (OSM) map and subsequent data. Here comes the fifth article of this series, dedicated to the extraction of OSM metadata starting from the OSM history data. In previous articles, dedicated to OSM chronological evolution and OSM tag set analysis, we saw examples of OSM data parsing. Here we will use a similar parser to get the OSM history, i.e. every versions of every objects for a given area within the OSM API. If you read the previous article, this parsing class should be familiar to you. 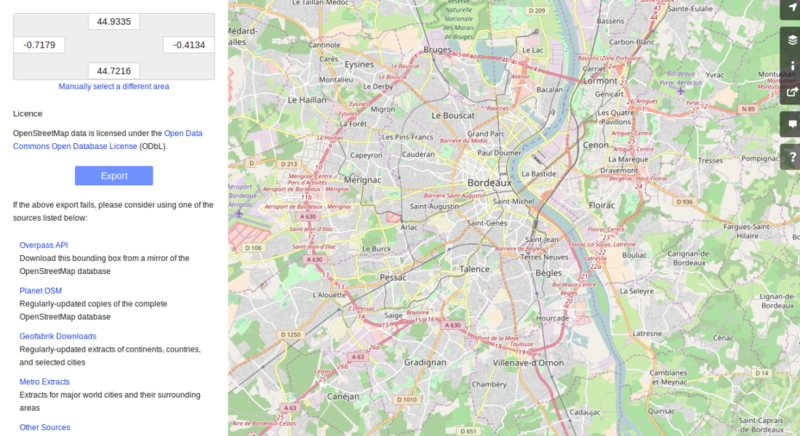 Let’s briefly recall its meaning: we read a native OSM file bordeaux-metropole.osh.pbf with the help of the pyosmium library, we store elements and basic information like versions, timestamps, user ids (and so on…) into a simple Python structure. In the end, using a Pandas DataFrame is even clearer. This structure can be saved on the disk, or handled directly within the Python workspace. Here we have the OSM data history corresponding to the area of Bordeaux. It is largely descriptive, however it says nothing about data quality in itself. We could compare the OSM data with some alternative data source, however there is no real consensus about the perfectness of any alternative data set. Knowing that, we choose to analyse metadata associated with OSM elements instead of data themselves. Some data agreggation operations are needed in this way, to better describe the OSM object evolutions. 2 What do we mean by metadata? Here we plan to go deeper than just considering the geometric data: some additional information is available if we check the history of contributions, and if we focus on different changesets, users, or even on meta-information about OSM elements themselves. in reality, no real add-on is made in terms of quality assessment: variables associated with elements are number of versions, of tags, of contributors and so on… It provides very interesting pictures of OSM data, but stays largely descriptive. Investigate on changesets could provide an additional information source. We know that elements are modified in the context of an opened changeset. We can count the number of modifications, assessing if some new elements have been created during a given changeset, or count the amount of elements that have been modified or even deleted. Classify changesets is possible: we could hypothesize that there are “productive” changesets, where a large amount of nodes, ways and/or relations are modified, and where modifications are durable from one hand; and less productive ones (we don’t say “useless”!) with less creations, less modifications and less durable elements. However the information may be gathered more efficiently by considering those who produce changesets: the contributors themselves. We can hypothesize that a user who contributes a lot, on every kind of OSM elements, and whose contributions stay valid for a long time (or even: are still valid!) is an experienced user; and the elements on which he has contributed are well-represented. The link between users and elements is more natural than between changesets and elements : it is possible to characterize OSM data quality by considering which type of user contributes the most to each element. In a more simple way, we can consider the most experienced user who’ve contributed on an element as a flag about the element quality. The quality of an element may also be indicated by the type (more or less experienced) of its last contributor. This last hypothesis will be our central thread in the next section (and… *spoiler warning* in the next articles!). Here comes the time to consider each user. We begin with the time they’ve spent on OSM. With these short code lines, we have gathered some temporal features in order to know how each user contributes through time. In the provided example, the user with the ID=4074141 is registered as an OSM contributor for 258 days; his lifespan on the OSM website is almost 3 days; he (or she!) made modifications at two different days. Each changeset is associated with its starting and ending time, its duration (in minutes) and the responsible user. We then may associate a changeset quantity and mean duration time for each user. Wow, there are some new interesting information there: we know that user 4074141 had produced three changesets during its lifespan, and the mean duration of these changesets is around 22 minutes. In order to characterize how the user contributes, a lot of additional features are still missing. The most important ones are related to the amount of modifications. Ok! This user is very active to map the Bordeaux area! He proposed 1832 modifications, amongst which 1783, 46 and 3 were respectively dedicated to nodes, ways and relations. However the amount of modified elements should be smaller, as this user made several contributions per element, on average. Here you can see a difference between the number of changesets and the number of element modifications. As a reminder, a changeset can include several modifications, see [[https://wiki.openstreetmap.org/wiki/Changeset][the description of OSM changesets]] on the official OSM wiki. The number of modifications can be described even more finely! Why don’t we consider if modifications are still valid, or if other modifications arise after the user action? What about elements that have been deleted since (we consider that working on a useless element is not so valuable for the community)? That’s a complete picture of the 4074141 user contribution, isn’t it? Amongst the 1783 modifications on node, there are…1783 improvements (so, no creation, no deletion). 598 of these modifications have been corrected by other users, and 1185 of them refer to auto-corrections; but no modification result in up-to-date nodes! We can draw a comparable picture for ways and relations. As a result, we have identified a user that contributes a lot to improve OSM elements; however his contributions are never enough to complete the element representation. By considering every single user that has contributed on a given area, we can easily imagine that some groups could arise. In this new blog post, we have presented some generic information about OSM contribution history. We’ve seen that user metadata can be easily built by some aggregation operations starting from OSM data history. We have proposed a bunch of features to characterize as well as possible the way people contributes to OSM. Of course a lot of other variables can be designed. We encourage you to think about it if interested in the topic! In the next blog post, we will see how to use this new information to group OSM users, with the help of some machine learning well-known procedures.